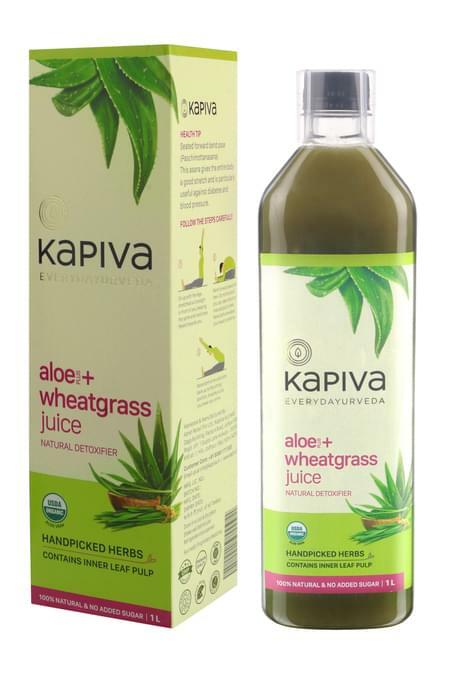 Kapiva’s 100% organic Aloe Vera and Wheatgrass juice is a great source of detoxification. The juice is made from hand-picked herbs and contains inner natural pulp of aloe vera. The Aloe and Wheatgrass Juice is 100% organic and free from any synthetic flavour, colour or oils. It cleans your blood by removing impurities and toxins. The product is sugar-free and contains no synthetic impurities to offer great benefits to purify your blood and keep your skin healthier. Benefits of Aloe Vera and Wheatgrass juice: • Cleans your blood by removing impurities from liver, kidney, lungs, and skin. • Wheatgrass contains numerous vitamins like A, B, C and K that offer multiple health benefits. • Reduces skin inflammation and promotes cell growth. • Acts as an anti-ageing agent and prevents fine skin lines. • Aloe vera detoxifies the digestive system and alleviates the acidity in the bowel. • Speeds up the metabolism and maintains healthy body weight. • Protects you from skin issues like pimples, acne, and other allergies. Usage: • Mix 30ml of juice in a glass of water. Add honey or salt or sugar to enhance the taste.